Centralized Cabling was introduced in 1996 with the publication of Telecommunications Systems Bulletin, or TSB-72, centralized optical-fiber cabling guidelines. 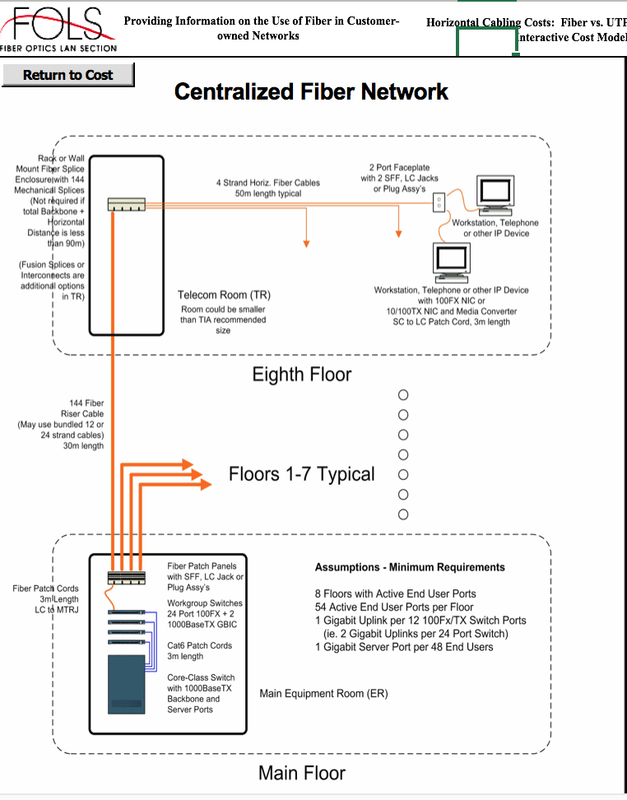 It was the first standards-compliant architecture that was developed to take advantage of the distance benefits inherent in fiber optic technology as it allowed users to centralize electronics--routers, bridges, hubs and switches--in one communications room within a building. This network architecture offered the potential to reduce the installed first costs of fiber networks, while at the same time increasing network flexibility, simplifying network management and reducing network outages. Until the publication of this TSB, the commercial building telecommunications cabling standard TIA/EIA-568A required that all horizontal and backbone cables be terminated in a telecommunications closet on each floor, using a full-horizontal crossconnect. For optical-fiber cable, this required the installation of four connectors and four adapters for every fiber, adding cost to the installation. With TSB-72, these patch panels are replaced with pull-through cables, a splice or an interconnect in the telecommunications closet. The TIA/EIA-568A standard was originally drafted with copper wiring in mind. The 100-meter length limit on cable runs between electronics and the workstation is based on the technological limitations of this medium. This length limitation often required that users distribute electronics in multiple communications closets near the workstations. TSB-72 allows cable runs to 300 meters by taking advantage of the bandwidth and low attenuation of 62.5-micron multimode fiber, which can support to 2.5 gigabits per second over this distance. Therefore, you do not need to install network electronics so close together; placing passive telecommunications closets near users is sufficient. While there are several advantages in deploying centralized cabling designs, the most immediate benefit to users is that centralized cabling typically lowers network costs by effectively reducing the number of ports and chassis throughout the network.